Successfully Added Audio Bug Gadget with Long Range 1500M Open Field Wireless Transmission to your Shopping Cart. Secretly listen to conversations with this Audio Bug Gadget. Simple and easy to use, this new model is one of our most popular yet and comes with Long Range 1500M Wireless for high quality audio ing from far away! This Audio Bug Gadget comes in 2 parts: an audio transmitter and receiver. The small wireless transmitter is a super discreet unit with a built-in microphone and flexible antenna, enabling it to be easily hidden anywhere in the field such as inside the bed, under tables, chairs, desks, etc. After you've found a safe spot, the transmitter allows you to pick up all voices and sounds (from whisper to shout) hundreds of meters away (up to 1500M in an open field). This Audio Bug Gadget also comes with an earphone jack for on the spot listening and an extra 3.5mm audio out jack for recording to a digital audio recorder, cassette tape, or portable DVR. This is an incredibly flexible and full-featured audio bug sure to help you catch and record the on-the-spot audio data you need. But that's not all, featuring self-developed DSP hardware modules, it eliminates the delay and noise, as well as voice echo to provide you with crystal-clear voice effect. However, if you thought those listening devices from the James Bond films were too advanced and expensive for normal people like you and me, then prepare to be surprised! This Audio Bug is a high quality gadget that comes with a low and affordable price and is made especially for the in you. The Audio Bug Gadget is waiting for you in our warehouse right now, so order yours today and we will express ship it out tomorrow! Brought to you by the leader in wholesale electronics and devices, Chinavasion. 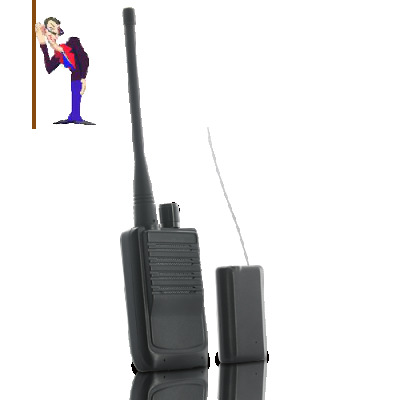 Professional grade audio bug with up to 1500 meter (in an open field) wireless transmission! Once again this store has surpassed himself. Very good transport packaging and arrived very quickly from HK to Greece. and once I complete this test will let you announce.